On our previous trip, we did not manage to go on any of the excursions trips due to the poor weather. This time round, we booked our Night Fishing on the day of our arrival, for the next day. The program is available almost every other day of the week. The Night Fishing at W Retreat cost US$85 per person. Starts from 6.30pm in the evening for 2hours. Advance booking is required. This is the boat that we are on, for the Night Fishing. Each boat sits about 10pax. On the day we were taking the excursion, two boats were departing for this excursion. The staff would drive the boat out to the open seas, for about 10minutes, before dropping anchors in the middle of the sea. Fresh baits are prepared on the spot. This is to ensure the freshness of the baits so that we can have a better catch. Preparing the baits on a hook below. This is a traditional Maldivian style of fishing, known as line fishing where lines are drop into the water, instead of using a fishing rod. Patiently waiting for my prey. I had no luck, but some members of the boat did have some luck. Oh, I forgot to mention the rules of this fishing trip. If we caught extinct species, such as rays or sharks, we have to let it back into the sea. There would be some charges for cooking the fish. So, for fishes less than 10cm, there's no point bringing it back for cooking. So, we have to return back to the sea. Guests can choose how they would like the fish to be cook and where they want to be done. 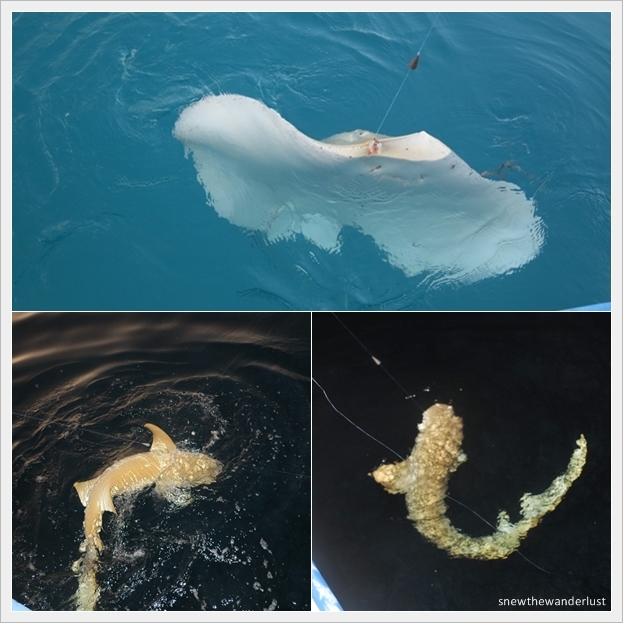 I don't know whether it's good or bad luck, but some members repeatedly caught sharks and rays. So they have to let it back to the sea. Look at the size of this ray being caught, even though the bait was not consider big. This guy is really lucky. He caught a few times, although twice was a ray and a shark. But he finally caught a fish that could be for his feast. I think his trick was to stand at the front of the boat, so that you can throw the bait further. I guess, coupled with a little luck, and probably, his experience in fishing. I am really lousy, or probably, just no luck in fishing. Initially, I didn't even know that my bait was already bitten off. Then, there was a time which I think I caught one, but when I retract the line, it's gone off. There were also a time which my line was entangled with another line, resulting in a false alarm. I think you really have to check on the tension of the line constantly, and retract it almost immediately. Papa Snew did manage to catch a small fish, but because it's less than 10cm, we have to let it back to the sea. Two members of the boat we were in, had luck. These are the two fishes caught. But even without any catch, we were very happy. It was indeed a fun and exciting experience, and paying for US$85 was a worthy experience. I mean, how often to you go fishing in Singapore and experience catching something in less than 2 hours? The next day, we booked a Sunset Cruise, in the hope that we will be able to catch a glimpse of Dolphins. The Sunset Cruise is priced at US$135per pax, on-board of a luxurious yacht. Starts from 5.30pm and takes about 1.5hrs. Closer glimpse of the yacht. We were taken on a tour of the yacht. 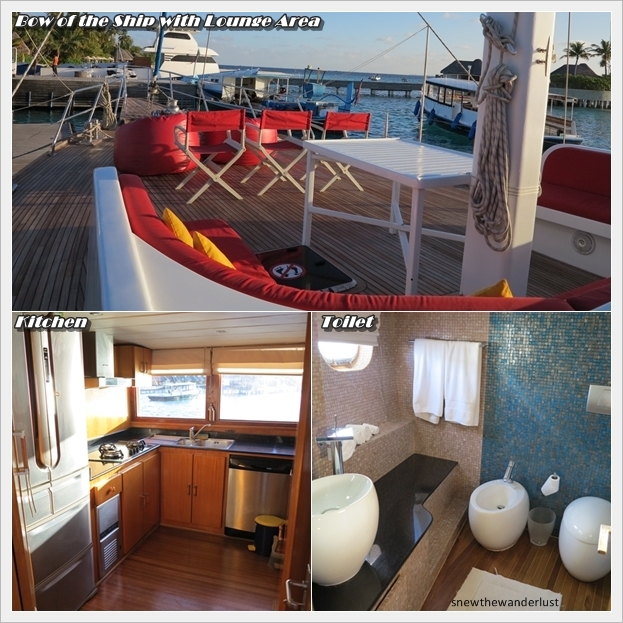 It's a full facilities yacht with 2 bedrooms, lounge areas, kitchen, activity areas. Guests can actually rent the yacht for half a day, one day, or even overnight around the islands. This cost at least US$2,500 for half a day. Probably only for the rich. The cruise includes a glass of champagne and some canapes for us to enjoy the beautiful sunset scenery. The sunset views that we enjoy. The moon descending as we are reaching back to W Retreat. As much as we enjoy the sunset cruise, we have no luck in catching any dolphins in sight. I wasn't really expecting much actually. But for US$135 per pax, it was a bit pricey just to go on one round to catch the sunset. Nevertheless, it was a relaxing leisure experience that we don't get in our everyday hectic life back home. These are some sunset views that was not taken while on the cruise. But I thought to share it.